Eliza is a brilliantly gifted singer and songwriter from Australia. 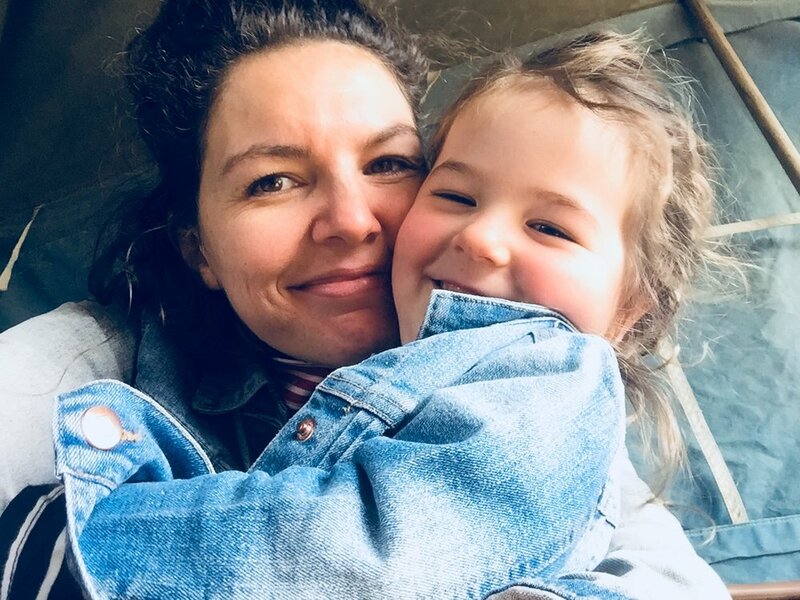 We got talking about preserving her creative process as a mother and artist, and the particular challenges and bounty that parenthood brings. Eliza also just produced a series for ABC called “We’ve Got This,” which is spotlighting, de-mystifying, and giving parents a much needed voice to discuss what it is like to parent with a disability. Thank you for opening our world more with your perspective, Eliza! I grew up in Wodonga, spent my early adult life in Melbourne and now have landed in Castlemaine, which is north of Melbourne. We love it here. Whilst parenting is challenging at times, it’s also one of the most magical experiences, and it really is life changing. I think for my partner and I, we were always out seeing live music, spending time with friends, going out for dinner, and of course all of this has had to slow down. With that has come a lot more time for home life, cooking, spending time just as a family, and making crafts with our daughter. It’s a beautiful thing when your main focus is someone else. I started singing when I was five, and then at age 14 I was given an old piano by a family friend that passed away. I began writing songs straight away, the first song I wrote was influenced by the Beatles, and was called 'hello goodbye'. You have been really outspoken about working and mothering with a disability. Can you talk about finding the courage to start speaking out about this? How has it changed your life? I have just released a series with the ABC titled ‘We’ve Got This,’ which is about parenting with a disability. I have a neurological condition ‘Charcot Marie Tooth’ disorder that affects my nervous system. When I was pregnant with my daughter I felt really unrepresented in all of the parenting books you get given, and I wanted to know what it was going to be like to be parent with a disability, but there was nothing out there. That’s how my idea came about, and it’s now developed into an eight part series. I have been travelling around the country interviewing parents with disabilities, to share their stories in a way that accurately represents their lives, and reduces some of the stigmas and stereotypes. As part of this series, I have talked about what it’s like for me to be a parent with a disability, and I have had such incredible support with this. It’s been an amazing feeling, because I know I am being truly authentic and letting go of fear. I really like when we have a day where we don’t have to do anything! It’s generally a Sunday. We spend all day in our pjs, read books, drink cups of tea, eat delicious food, sit outside in the sun, with no need to be anywhere. In my studio, which is out the back of my house. It has my old piano in there, which a family friend gave me when I was a teenager when she passed away. I treasure the sound it makes. It’s where I spend my time when I am writing. It means speaking my mind, letting go of fear, being authentic and when possible, going with the flow of the universe. Breathing, yoga and writing down all of the things I have to do and making a solid plan. What's the most challenging part about being a mom? Mother’s guilt. I find it hard when I am so excited to be away working on a new project, yet I feel torn because I want to be home. It’s something I have never experienced so strongly before, that feeling of wanting to be in two places at once. I just watched the ‘Star is Born’ film with Lady Gaga. She’s an incredible vocalist and performer. What do self-care and balance mean and look like for you? Taking time out for myself, where I am just looking after me. I do this by getting a massage, having a bath, or going out for a coffee with a friend. Embrace the little moments, because it all goes so quickly. And to realise when it’s hard that it will continue to change. How do you protect your creative process as a mother and artist? Has it changed after having kids? To be honest I actually feel more creative, and I feel like my work ethic has changed as well. When I am away from Isobel, my time is so precious so I really make sure I work hard and I think having that time pressure there has made me more present and have a stronger ability to get things done! My songwriting has evolved, the songs are more organic and natural, which I think, has come from slowing down.